If you have a gas fireplace or other type of appliance that is fueled by natural gas, you should always be aware of the dangers that are possible when there are damaged gas lines or other problems that could cause leaks. Although natural gas is safe enough to heat over 65 million homes in the USA, it is very combustible. Since gas goes up in flames faster and spreads even more quickly, a leak may put you at a much higher risk of a fire and even an explosion. 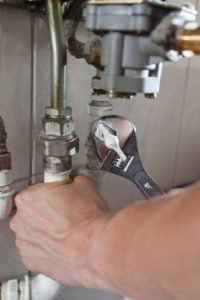 As part of our professional home maintenance services, Steele Plumbing specializes in gas leak detection as well as gas line repair and repiping. Because of the possible dangers involved with a gas leak, we would like to tell you more about how to spot signs of this safety hazard. Often described as smelling like a rotten egg, natural gas has a very strong odor. This smell actually comes from an odor additive so that it is easier to detect. According to The Spruce, if you can smell that distinctive odor of natural gas in your home, it could be a sign there is a gas leak. Another sign from the inside of your home is hissing sounds coming from the area around your gas appliance. If you ever notice either or both of these signs of a gas leak, contact us ASAP! Steele Plumbing has seen gas leaks be responsible for gusts of air that blow up dirt knock over potted plants. If you notice air coming from the ground outside near your home, this is a sign of a gas leak. A leaking gas pipe may also cause bubbles to appear on the ground, especially in moist areas. Gas leaks can also lead to the appearance of flames that appear to dance above the ground. Any plants near a gas leak can become very sickly and die prematurely. When fruits and vegetables come into contact with natural gas, they will change color. Gas leaks block the sources of oxygen from plants and flowers, so if your plants have wilted and died without any obvious causes, you could likely have a gas leak in your home. A sure sign is when a patch of dead or discolored plants is surrounded by healthy green plants. If you suspect there is a gas leak in your home, stay calm and go outside. Once you are at a safe enough distance from your house, contact us at Steele Plumbing after you have called your gas company. No matter if you need us during our normal business hours or have an emergency at 2 AM, we will be right there to help restore your safety with our gas services.